Dog Writes Woofin’ Wonderful Book! When a great dog writes a great book, he’s far from barking up the wrong tree! 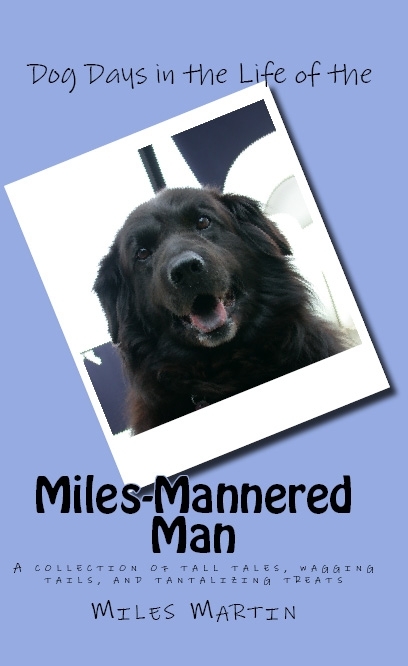 “Dog Days in the Life of the Miles-Mannered Man” is a heart-warming and hysterical collection of tall tales, wagging tails, and tantalizing treats. Dog fans everywhere love how relatable this Forever Dog…. er… ah… Fur-ever Dog is. After all the “atta-boys” for his limited edition hard cover, Miles’ book is finally available in paperback and as an easy e-book. This makes a dog-gone superb gift for anyone… or yourself, if you’ve been good! Check it out on www.Amazon.com by simply searching for Miles Mannered Man, if the link fails. So… get your copy, published by Quiet Thunder; then grab a biscuit and a cool bowl of milk and enjoy the “Miles-Mannered Man.” If you get it from Amazon.com you get the value-added benefit of being able to then snag the Kindle digital eBook copy for FREE (rather than the usual $7.99). Woof! PS. Oh, and there are a few other titles from Quiet Publishing, as well, but dog fans think that Miles’ book is the cat’s meow. 10 Responses to Dog Writes Woofin’ Wonderful Book! And Miles did not write one of those tear-jerker ending deals. This one won’t break your heart… but it will tickle your funny bone!